Alaska, the last frontier. If you’re grown tired of taking your rig around the lower 48 and are looking to expand your horizons, then it’s time to head to the Land of the Midnight Sun. RVing in Alaska presents a unique set of circumstances and challenges and circumstances and you need to make sure you’re prepared. That’s why I’ve put together this brief guide on RVing in Alaska, how you should get there, and why you should consider renting an RV once you arrive versus driving all the way up there yourself. 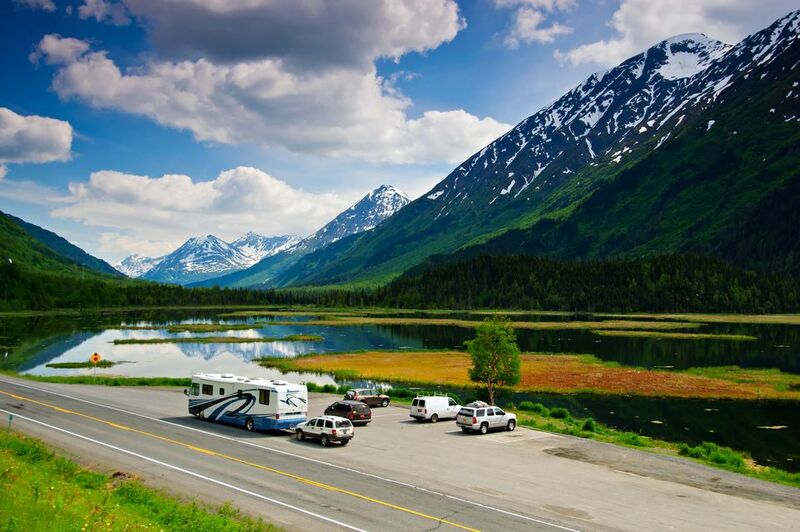 Most people will need to rent RVs when heading to Alaska but if you’re close enough or you’re okay with the long drive you can take your own RV into Alaska. It’s not a straight shot from the lower 48 into Alaska. You need to pass through Canada and there are some specific rules and guidelines you need to follow. Check out my article on RVing to Canada to get better feel on what you need to cross the Canadian border. As far as driving in we definitely recommend the Alaskan Highway, which actually begins in British Columbia, Canada. Pro Tip: I recommend only experienced RVers tackle driving or towing through Alaska, especially if you’re going to try and tackle some of the most remote locations. For most travelers, the better option will be to fly in and rent an RV. Alaska has different reliable RV rentals depending on your starting point. I recommend using internet searches and RV forums to find the highest rated rental services, this is Alaska, don’t wing it. There’s a variety of Alaskan-based RV rental locations, along with CampingWorld, El Monte RV, and Cruise America in the Pacific Northwest to rent from. Pro Tip: Renting an RV for a trip north will cost a pretty penny, but it’s well worth the expense to check this destination off your bucket list. Be prepared for sticker shock! A special note about Alaskan highways, they do all have designated numbers, such as the AK-4 but they all have accompanying names like the Richardson Highway as well. When asking for about a road or looking for directions always refer to the road by its designated name instead of the route number. For example, ask how to get to the Denali Highway, not the AK-8. You will more than likely be heading to Alaska during the summer, which is the same time most construction takes place on Alaskan roads. Expect a lot of dust and rocky conditions in these construction zones. Take it slow and turn the AC on high so you don’t accumulate a great deal of dust on the interior of your ride. Some hazards to be aware of when traveling through Alaska include frost heaves, soft shoulders, and potholes. The latter occurs more frequently after winter before Alaska’s Department of Transportation (DoT) has a chance to fill them. Soft shoulders plague most of Alaska’s highways because of the combination of climate, especially during winter, and roads built on even surfaces. If you have to pull over, ensure you’re only on steady ground. Not so much a hazard but something to be on the lookout for is the gravel roads you’ll take to and from some locations in Alaska. In fact, some directions may pull you off the highway and onto these gravel roads to get to your destination. Parts of Denali Highway, McCarthy Road, Skilak Lake Road, and Top of the World Highway are some of the gravel roads you’ll face when driving or towing in Alaska. Pro Tip: Gas stations can be few and far between in Alaska. This is why planning your route is imperative. You want to be able to get at least 200 miles per full tank of gas in Alaska to avoid being stuck on the side of the road. Otherwise, careful planning and gas rationing can help you get between gas stations and destinations. If you decide to go to southeast Alaska, also known as the Alaskan Panhandle, you will need to ferry your RV. RVs need specialized spaces so you need to make sure to reserve your space on the ferry well in advance. Ferrying your RV into Alaska can be more hassle than it’s worth unless you want to hit as many states as you can in your own rig. Though Alaska is more rugged than the lower 48 there are still plenty of reputable RV grounds, resorts, and campgrounds. The best news is you can still use some of your favorite RV clubs, like Good Sam or Passport America to find the best parks. If you’re not a member of a club, you can still use a site like RVParkReviews or Trip Advisor to find the best grounds for your destination. You can also check out my top five RV parks in Alaska to see if you’ll be traveling to my favorite spots. Keep in mind that Alaska sees more daylight than most of the world throughout the year, especially during the summer months. Most Americans and travelers aren’t used to that. Ensure you invest in black out shades or a good sleep mask as you’ll often go to bed before the sun goes down which can affect your sleep patterns. Pro Tip: Alaska is one of the only places in the world where it’s legal to pull over anywhere and RV boondock style. Highway pullouts, shoulders, and other areas off the road are prime spots for getting some sleep and prepping for the next day’s travel. In the end, the more prepared you are for a trip to Alaska, the more fun you will have. Take as many steps you can to cover all your bases such as planning out your route and make out an itinerary. One of the most beneficial steps you can take is starting a dialog with someone who has taken the trip before. They can answer specific questions and let you know what to expect. Use RV forums to find someone to correspond with for insider tips on this trip. Alaska is a once in a lifetime experience and we recommend that every RVer gives it a go. RV season in the state runs from June to August, so you have a short window to enjoy the trip. Plan ahead, have fun and enjoy the last frontier like few get to enjoy.